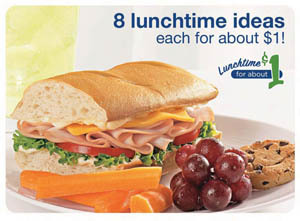 Kraft Foods and Sam’s Club have teamed up to create Lunchtime for About $1, a free download of 8 tasty meal ideas that won’t break the bank. You can sample some of these great meal ideas yourself during the next Kraft Foods tasting event on August 7-8 at Sam’s Club. You can find your closest Sam’s Club here. Now what’s better than Lunchtime for About $1? How about FREE lunch? Already a Sam’s Club Member? Enter to win a $100 Sam’s Club gift card! Not a Sam’s Club member? Enter to win a one-year Sam’s Club membership and a $50 Sam’s Club gift card! Leave a comment telling me which meal idea from Lunchtime for About $1 you’d like to try or tell me which Kraft product featured in this promotion is your favorite. In your comment, you will also need to tell me whether you are a Sam’s Club member. If you’re reading this post in an e-mail or a feed reader, click here to enter. This giveaway is open to all US residents ages 18 and older and will end at 9 p.m. CST on Thursday, July 1, 2010. Only one entry per person and only one winner per household. The e-mails I collect in this giveaway will only be used to contact you if you are a winner and will never be publicized. I’ll be using Comment Contest to randomly select two winners from all of the comments received. I will then notify the winners by e-mail and announce it here at Northern Cheapskate. The winners will have 48 hours to respond or I’ll draw a new winner. Be sure to stop over at Stockpiling Moms and Mommy’s Wishlist for two more opportunities to win with Kraft Foods and Sam’s Club! Disclosure: Kraft Foods is providing the prizes for this program at no cost to me. This program is not administered by Kraft Foods or its affiliates, but solely by Christina Brown, Northern Cheapskate. I am working with Kraft Foods and Sam’s Club and using the new Kraft Foods and Sam’s Club Lunchtime for about $1 program. While I have been compensated for my time and grocery costs, my opinions are my own and I have not been paid to post positive comments. I would like to try the cajun turkey panini. it looks easy, low calorie and filling. I think hubby would like the cajun turkey panini. I would like to try the Mexican blend cheese. We don’t have a Sam’s membership. Definitely the cajun turkey panini. We currently are not members of Sam’s Club. The Hawaiian BBQ Ham sandwich sounds really yummy! The hawaiin BBQ ham sandwich sounds good to me, and I promise I didn’t just look at the person’s entry before me. :) I thought the chipotle turkey quesidilla looked good, too. I am a Sam’s member, and would LOVE to win a gift card for there. I buy a lot of things from them, and really like having a Sam’s close by. chipotle turkey quesadilla, I love Quesadillas! I’d like to try the Quick Cobb Salad. I’m not a Sam’s member, but I’d love to be one! I’m going to try the quick cobb salad. I eat salad 5 days a week for lunch and this one looks interesting. I am a Sams member and shop thee at least once a month. The Cajun turkey panini looks good to me and easy-I’d probably have the ingredients on hand as well. I’m not a Sam’s club member. I would like to try the Turkey Chipotle Quesadilla. I am a Sam’s Club Member. The Hawaiian BBQ ham sandwich…yum! I’m not a Sams Club member. The Quick Cobb Salad $1 meal idea looks tasty! I would like to try the quick cobb salad. I am not a Sam’s member. I would like to try the Turkey sandwich combo. I would like to try the Hawaiian BBQ Ham Sandwich. It looks good. I am not a member. I’d like to try the turkey sandwich combo. I’m not a Sam’s Club member. I’d try the Ritz Cracker Bites and More… especially with our son away. My girls and I love more snacky lunches… this would fit the bill!! Simple, light and appetizing. We do not have a Sam’s membership at this time. The Chipotle Turkey Quesadilla sounds amazing! The Quick Cobb Salad is delicious! Would love to try the Quick Cobb Salad. Already a Sams member. I need to eat more salads so I’d choose the quick cobb salad. I am not a Sams member. I’d like to try the Quick Cobb Salad. No, I’m not a Sam’s member. The Lunchtime Hot Dog Picnic looks delicious and a quick fix lunch. I am not a Sam’s Club member. The turkey sandwichcombo loks good.I amnot a Sam’s club member. i like the ritz cracker bites and more.i am not a sam’s club member. I would like to try the chipotle turkey quesadilla recipe. I am a Sam’s club member. I’d choose the Turkey Sandwich Combo. I forgot to tell you in my comment #35 that I am a Sam’s Club member. I am not a Sam’s Club member and I would love to try the Hawaiian BBQ Ham Sandwich and More! I like the turkey sandwich combo. I am a Sam’s club member. I’d like to try the Chipotle Turkey Quesadilla. I am not a Sam’s Club member, though they often offer one day passes, so I plan to check it out. I like the turkey sandwich combo. It looks good. I’m a Sam’s club member. The chipotle turkey quesadilla sounds like something my entire family would enjoy. However, the quick cobb salad would go over really well for just myself! I am a Sam’s Club member. cajun turkey panini sounds yummy. i am a sams club member. The chipotle turkey quesadilla looks tasty! I am a Sam’s member. The quick cobb salad. I’m a Sam’s club member! thanks. I would make the turkey chipotle quesadilla. However I’d definitely add some veggies to them. Perhaps some pepper and onion strips! I am not a sam’s member. Great giveaway! I think the Chipolte Turkey Quesadilla’s on the Lunchtime for $1 sound so good! I am not yet a Sams Club member, and would love to win a one-year Sam’s Club membership and a $50 Sam’s Club gift card! I would love to try the Cajun Turkey Panini! Sounds delicious! the hawaiin bbq sandwich looks great. or the turkey quesadilla! i am not a member of sam’s club. Definitely the cajun turkey panini! The cajun turkey panini looks delicious. I am a Sam’s Club member. I would like to try the quick cobb salad. I am a member of Sams Club – I love it! I’d really like to try the Chipotle Turkey Quesadilla! And, I’m not a member of Sam’s Club, but I would LOVE a membership! I’m a Sam’s Club member.Kraft cheese is my favorite. Would love to try the Chipotle Turkey quesadilla I am a sams club member. I’d love to try the cajain turkey…makes me hungry looking at all those yummy sandwiches and food! I would choose the Chipolte Turkey Quesadilla, looks yummy! The cajun turkey panini looks delicious and I’m not a member of Sam’s club. I’d like to try the Chipotle Turkey Quesadilla — I’m a Sam’s Club member :) *Thanks* for the giveaway! I love the Quick Cobb Salad! I am trying to eat healthier and that salad is delish! I am a Sam’s club member and think everyone should join! All the recipes looked great!! My favorite one though is the Cobb Salad. It’s quick and easy to prepare besides being nourishing. Kraft cheese is one of my favorites in this recipe. I use it on almost everything. I have been a Sam’s Club member for years. Thank you for the contest. I would like to try the Chipotle Turkey Quesadilla. It looks good to me. I am a Sams card member. Via RSS – the turkey quesaddia looks like the ticket for a perfect $1.00 lunch! Fast Fix lunchtime! I love some mac and cheese. And I am not a Sam’s club member. My family would love to try the Quick Cobb Salad! I am a Sam’s Club Member. This is our favorite place to shop. I’d like to try the turkey cajun panini. I’d like to try the chipotle turkey quesidilla. I would love the Turkey Sandwich Combo…mmm! Chipotle Turkey Quesadilla here! I am a happy member of Sam’s Club! I would love to try the Cajun Turkey Panini — and I am a current Sam’s Club member. Thank you for hosting this generous giveaway – I would be SO thrilled to win!